[Source: Jahna Berry, Arizona Republic] — Phoenix City Council members and their top aides may have to tell a court whether they had improper talks with the developer of a proposed $200 million W Hotel project. Last week, a Maricopa County Superior Court judge ordered a trial to sort through conflicting accounts about how the developer tried to sway city leaders to build the project. That means council members and top aides may have to testify about the behind-the-scenes lobbying tactics in the controversial project. Developer Suns Legacy Partners was poised last year to build a 39-story W Hotel near US Airways Center in downtown Phoenix. A key part of the project was an 11-story office and condo tower that would have been built on top of a historic warehouse, preserving it from being torn down. Even if Phoenix wins the court case, litigation and other problems have effectively killed the hotel project for now. Legal wrangling has delayed the project, and the developer’s deal with W Hotel expired because ground was not broken by June 30. In his four-page Sept. 18 ruling, Maricopa County Superior Court Judge Peter Swann wrote that a trial would have to sort out whether Mayor Phil Gordon, his council colleagues, and their aides had improper talks with Suns Legacy Partners, the development group that includes Suns owner Robert Sarver and former Suns owner Jerry Colangelo. The preservationists are prepping for trial, although no date has been set. They filed the lawsuit to protect the 1920s warehouse, the last vestige of Phoenix’s old Chinatown. “Phoenix can do better with its historic structures.” said Barry Wong, a former state lawmaker who is a spokesman for the coalition of preservationists and Asian-American community groups. The City Council was essentially sitting as a judge when it overruled the historic-preservation officials who didn’t think the condo tower should be built on top of the historic warehouse, the coalition argued in court. When acting as judges, council members can’t have outside talks with the parties in the dispute, the preservationists argued. The warehouse, the Sun Mercantile Building, is owned by the city. Suns Legacy Partners has a long-term lease agreement. Lawyers for both sides agree that preservationists and the hotel developer lobbied the City Council. However, the preservationists argue that council members and their top aides — including the mayor’s senior assistant, Bill Scheel — may have been swayed by undisclosed talks with the Suns Legacy developer. The contacts included a Dec. 6 letter from the developer’s lawyer. The preservationists also point to a form letter that Scheel used to respond to several people who e-mailed Gordon about the project. In addition to replying on behalf of Gordon, Scheel lauded the project as a “reasonable and positive re-use” of the 1920s warehouse. Scheel, who has helped run Gordon’s election campaigns, downplayed the letter. Gordon said his staff gives him advice, but ultimately he and the rest of the council made the final call. In court, the city argued that council members were more aggressively lobbied by residents and groups that opposed the 11-story tower. The city’s legal team also argued that the City Council avoided communicating with either side after it was clear that issue would be appealed to the full council. Since council members are routinely lobbied on issues, it would have been impossible for them to know before the appeal that they should be careful about talking about the case, Verburg said. In affidavits, council members said that they did not talk to the developer after Suns Legacy appealed the decision the historic preservation decision. Swann, however, ruled that any contact with parties in the hotel fight could fall under scrutiny. According to Barry Wong, chair of the Save SunMerc Coalition, Sam was a friend and advocate of the effort to preserve Sun Merc and establish an Asian-American museum. During the last several weeks Sam spent many hours researching and learning about the Coalition’s efforts for a story he wrote and was published in several national Asian print and electronic media. Barry knew Sam for a number of years, but it was through many phone conversations these past several weeks did Barry get to know Sam better, personally and professionally. Sam was truly dedicated to the Asian-American community, was a caring person, and a first class journalist. Through his Sun Merc reporting he wanted to help the Sun Merc cause, but was careful not to appear biased, especially as an Asian-American journalist. While he went through great lengths to write a balanced story, he was hopeful a positive outcome would occur in small part because of the information he conveyed. Sam told Barry that he wanted to be present at the museum’s official opening. 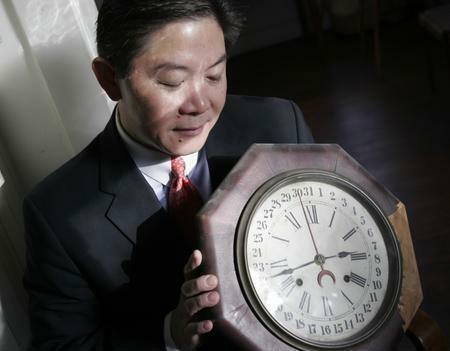 [Article and photo by Angela Cara Pancrazio, Arizona Republic, Phoenix Section, Page 2] — Former State Rep. Barry Wong is deeply involved in trying to stop developers from building an 11-story condo and mixed-use tower on the top of the Sun Mercantile Building, the last reminder of Phoenix’s lost Chinatown. As chairman of the Save SunMerc Coalition, he has rallied support for the old grocery warehouse and for an Arizona Asian-American museum to be located there. 1. Fighting to save the Sun Mercantile has become a full-time job for you. What are you trying to save? At the turn of the 20th century, the first group of Chinese laborers gravitated toward Chinatown. It’s not the building itself, or Shing Tang, the Chinese businessman who owned the Sun Merc in the 1920s; it’s a symbol of an era of a class of people. 2. When did your family first come to Phoenix? My grandfather first arrived in San Francisco in the 1920s; he came to Phoenix to help out at his cousin Henry’s grocery story. He saved enough for his own store and to bring the rest of the family. I was born here. 3. Why did you decide to lead the coalition? Having been in politics and being a lawyer, I learned about the system: If you want something in America, you have to stand up and ask for it. 4. Did you meet some resistance from some members of the Chinese-American community? Yes, the old philosophy is that you don’t make waves. That’s what the Chinese brought here. It doesn’t work in America. I was worried that the history of the Chinese-Americans would be swept underneath the rug. 5. But the elders backed you at the Phoenix City Council meeting last month to rule on the high-rise development? Yes, I spoke to the seniors at the Chinese senior center. I had more seniors willing to attend the rally to save the Sun Merc than vans. I’m proud of the community because they cared enough to show up. 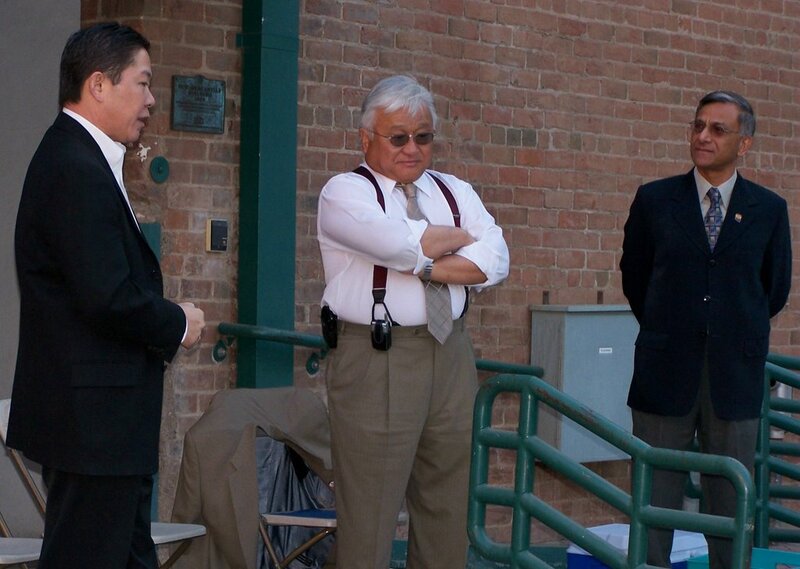 U.S. Representative Mike Honda (D-California) visited with 50-some members of the Arizona Asian American Association (AAAA) outside the Sun Mercantile Building on Saturday, January 21, 2006. AAAA President Arif Kazmi (right) and Save SunMerc Coalition Chair Barry Wong (left) welcomed Rep. Honda to Phoenix. Phoenix City Council at its December 14, 2005 hearing sided primarily with the real estate developer and ignored most of the pleas of the Chinese- and Asian-American and historic preservation communities to preserve the historic 1920s Chinatown Sun Mercantile Building and set aside 4,500 square feet of space for a history museum. The council allowed the developer to build 11-stories of condominiums through and above the Sun Merc. In addition, in hopes of pleasing the Chinese- and Asian-American communities, it required the developer to set aside 1,000 square feet of space inside the Sun Merc and 1,000 square feet of space outside the Sun Merc for exhibits and displays for museum use, and required the developer to donate $75,000 over two years to the newly created Arizona Asian American Museum Foundation. Rally, Lion Dance. The day began with a rally outside next to the council chambers by supporters of saving the Sun Merc. Over 100 supporters attended the rally where a pair of traditional Chinese lion dancers performed to bring good luck to and drive away evil spirits from the city council hearing. Supporters held up signs in English, Chinese, and other Asian languages to save the Sun Merc and for an Asian museum. They were heard chanting “save Sun Merc, save Sun Merc, save Sun Merc.” It was quite a scene, with television, radio and newspaper reporters present to record the moment. Barry Wong, Chairman of the Save SunMerc Coalition, gave remarks energizing supporters in advance of the council’s hearing. Council Hearing: Community Leaders Speak. The City Council started its hearing at 5 p.m. to address the Sun Merc matter. By way of background, the luxury hotel and condominium developer had appealed the prior decision of the city’s Historic Preservation Commission that favored the historic preservation and Asian American communities. The Commission required the developer to remove from its plans the 11-stories above the Sun Merc and that at least 4,500 square feet of space be reserved for use by the Asian American community for history museum use. Nearly 200 supporters of saving the Sun Merc and setting aside space for an Asian American museum attended the hearing, mostly Chinese- and Asian-Americans. Also, 30-some members of the Chinese Senior Citizens Association, led by its president, Mr. Wen, made a special trip to attend the hearing. This issue, for the first time, galvanized the Chinese- and Asian-American communities to attend and protest their city government elected leaders to take action in support of their community. After city staff and the developer’s representatives spoke, Barry Wong was called up by the mayor to testify and make an opening statement on behalf of the Save SunMerc Coalition, followed by Jim McPherson, President of the Arizona Preservation Foundation. The public was later given the opportunity to comment as well. Many Chinese- and Asian-American community leaders stepped forward to speak, including Dr. Pearl Tang, wife of the late Hon. Thomas Tang, former Phoenix Vice Mayor and U.S. Court of Appeals Judge for the Ninth Circuit; Eddie Yue, President, Chinese United Association of Greater Phoenix; Eva Li, president, OCA/Phoenix Chapter; Arif Kazmi, President, Arizona Asian American Association; Annie White, Overseas Chinese Woman’s Club; John Tang, past president, Chinese United Association; Doris Ong, member, Board of Trustees, Phoenix Art Museum; and Virginia Chang, President, Desert Jade Woman’s Club. Decision, Future Action. After nearly three hours of testimony, the city council discussed the issue and rendered its decision. After the decision was announced, the developer still would not commit to the 1,000 square feet designated for inside the Sun Merc and wanted the council to place more restrictions on how the Arizona Asian American Museum Foundation could use the developer-required donation of money. Supporters of Sun Merc in the audience were disappointed with the council’s decision, then booed and groaned upon hearing the offensive, non-committal statement from the developer. The Save SunMerc Coalition will meet with their legal advisors to decide whether to appeal the council’s decision to court. Save SunMerc Coalition was formed and has been working daily since early October 2005, in conjunction with the Arizona Preservation Foundation and other historic preservation groups, to preserve Sun Merc and secure space for a museum. Core members of the Coalition are Barry Wong, Eddie Yue, John Tang, Dr. Pearl Tang, Arif Kazmi, Doris Ong, Lani Wo, past president, Chinese United Association, Arnold Wo and Chantri Sukpon Beck, President, Thai-American Friendship Organization. Thanks to Ed Sharpe of the Glendale Daily Planet, the Phoenix City Council meeting of December 14, 2005 was filmed (apparently city government doesn’t film regular council meetings for later broadcast on Channel 11; only policy sessions). Click here to access the unedited footage and photos from the public rally and hearing where the fate of the historic Sun Mercantile Building in downtown Phoenix was debated.